Robotic process automation is the use of specialized computer programs, known as software robots, to automate and standardize repeatable business processes. Imagine a robot sitting in front of a computer looking at the same applications and performing the same keystrokes as a person would do. While Robotic Process Automation does not involve any form of physical robots, software robots mimic human activities by interacting with applications in the same way that a person does. Working as a virtual assistant, bots complete tedious tasks, freeing up time for employees to concentrate on more interesting, revenue-generating tasks for an organization. Part of the beauty of robot process automation technology is that even non-technical employees will have the tools available to configure their own software robots to solve their automation challenges. Robotic Process Automation enables business professionals to easily configure software robots to automate repetitive, routine work between multiple systems. These “bots” work directly across application user interfaces, mimicking the actions a person would perform, including logging in and out of applications, copying and pasting data, opening emails and attachments, and filling out forms. While existing capabilities of screen-scraping and macros software technology may come to mind, RPA is an evolution beyond these solutions. RPA is becoming an important automation tool driving digital transformation and the future of work. Low technical barriers: Programming skills are not necessary to configure a software robot. As a primarily code-free technology, any non-technical staff can use a drag and drop process designer to set up a bot—or even record their own steps to automate a process through a process recorder feature. Increased accuracy: Bots are extremely accurate and consistent – they are much less prone to making mistakes or typos than a human worker. Meet regulatory compliance standards: Bots only follow the instructions they have been configured to follow and provide an audit trail history for each step. Furthermore, if steps in a particular process need to be reviewed, bots can also play back their past actions. The controlled nature of bot work makes them suited to meeting even the strictest compliance standards. No interruption of work: Operations can be performed 24/7 as these bots can work tirelessly and autonomously without requiring staff to manually trigger bots to initiate business processes. If a human does need to intervene, it is to make a decision or resolve an error. Existing systems remain in place: Unlike traditional automation initiatives that may require extensive developer resources to integrate across multiple applications, RPA involves no disruption to underlying systems. Robots work across the presentation layer of existing applications just as a person does. This is especially useful for legacy systems, where APIs may not be immediately available, or in situations where organizations do not have the resources to develop a deep level of integration with existing applications. Improved employee morale and employee experience: Employees will have more time to invest their talents in more engaging and interesting work. Bots enable workers to offload manual offload tasks like filling out forms, data entry and looking up information from websites, so workers can focus on strategy and revenue-producing activities. Increased productivity: Process cycle times are more efficient and can be completed at a faster speed compared with manual process approaches. As RPA advances even further, future generations of the technology will only bring additional value. Advanced cognitive capabilities such as machine learning and artificial intelligence will allow bots to more intelligently interpret the interfaces they work across, better handle errors, and manipulate unstructured data. Machine learning allows bots to recognize patterns over time; this means that when a process requires human intervention, a bot learns and acts autonomously when the situation happens again. What processes are relevant to RPA? Note that this is a general list of common business processes where RPA can be applied – there are countless more examples. Though we may think of RPA being applied to processes touched by multiple people in an organization, RPA can be applied as a personal productivity tool as well. Employees will be able to identify many opportunities in their daily work where a personal bot assistant can help. After all, the IT department will not be able to completely solve all automation needs of the business – with RPA, employees have access to a self-serve automation tool that will empower them to reduce their own tedious work, no matter what their field or technical background may be. Requiring a low technical learning curve as well, RPA can be made available to a wide range of employees and would not need to necessarily involve a resource-intensive, enterprise-wide scale deployment effort. Furthermore, since all bots can be monitored and audited over a centralized server, IT would still be able to maintain central control over bots in use, while promoting flexibility in the organization for employees to deploy their own custom solutions. Especially with changing priorities a common workplace reality, employees are oftentimes faced with increased expectations and workloads. Having an immediate personal bot assistant can help alleviate the time-consuming and uninteresting tasks so employees can focus on what is most important. A bot can help bridge the gap between organizational goals and worker bandwidth. RPA can be an important tool in solving automation challenges and pushing organizations to grow into digital workplaces. However, it is just one part of an organization’s digital transformation toolkit. Going beyond automating everyday repetitive tasks, RPA combined with traditional content services and business process management technologies can help organizations reach even higher potentials and make the most of their of automation strategies. Whether optimizing end-to-end automation initiatives or enabling employees to be more efficient in handling one-off projects, RPA helps fill in the gaps as a powerful, complementary technology to reduce costs and increase productivity. 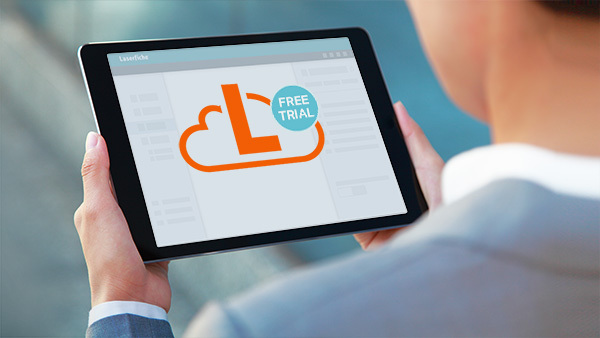 Laserfiche’s content services and process automation capabilities have long fueled digital transformation initiatives for organizations worldwide. 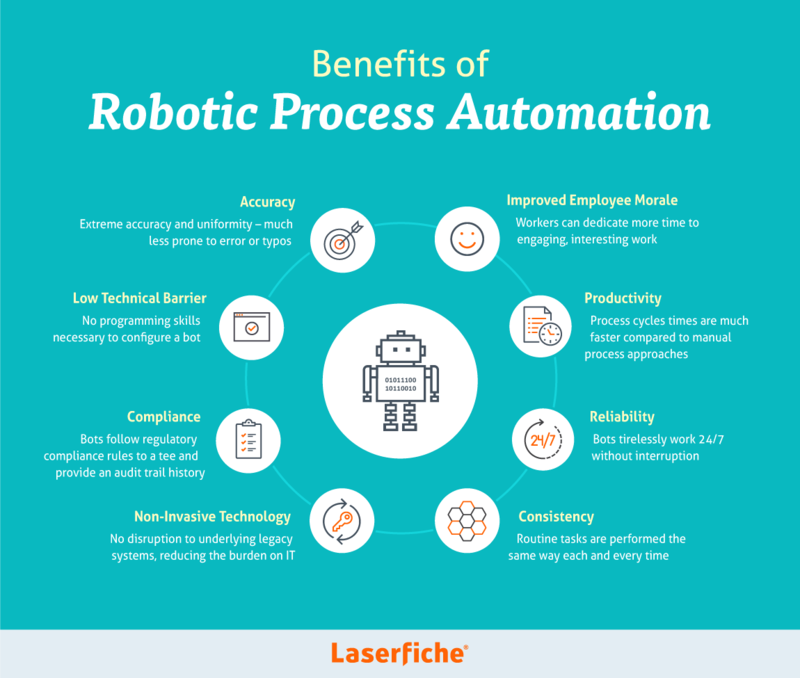 By adding RPA to its process automation ecosystem, Laserfiche further enables employees to focus their talents more on the work that matters. Download the Guide to Robotic Process Automation to take a closer look at the features, benefits and use cases of RPA.